SIXTEEN-year-old Brandon Stockdale landed his first Flemington winner on Saturday and underlined why he’s being tipped for stardom when successful on Bon Rocket in the Young Members Ball (1400m). Stockdale had a torrid ride to get Bon Rocket home as his saddle slipped soon after the start. This was just the third time the teenager had ridden at Flemington and it was his sixth ride at the track. It was also his second city winner. Bon Rocket’s trainer Wendy Kelly led the charge with the plaudits for Stockdale. “This kid is going to be a champion as an apprentice and then as a senior jockey,” Kelly said. Stockdale said he was thrilled to have ridden his first Flemington winner especially with Kelly training him. 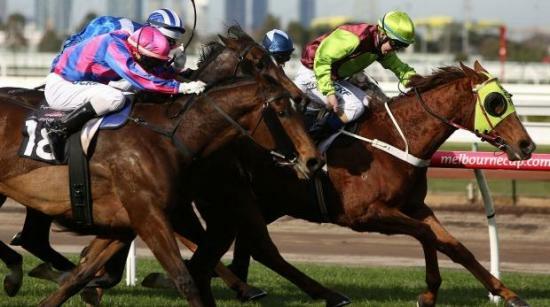 “It wasn’t an easy ride as it wasn’t too long from the gates, about 200m and I noticed it shifting forward and it did so badly,” Stockdale said. Stockdale said he hadn’t planned to lead but had to after that. The saddle slipped back into the right spot. I knew the horse would kick back,” he said. Stockdale got enough of Bon Rocket to defy a wall of horses behind him as eight horses were within a length of him. Bon Rocket ($18) defeated Bradman ($26) by a short half head with Mihany ($6.50) a long head away third. Kelly also had I’m Ablaze in the race but took him out after he drew barrier 18. Bon Rocket is by Bon Hoffa, who Kelly trained to win the Sir Rupert Clark Stakes at Caulfield. “I’ve got quite a few by him and they’re going super,” Kelly said.